Besides the good feedback and discussions around my talk, i just had a great few days. It was my first time to Russia and i saw and learned a lot. One unexpected event was going to a russian Sauna with Amir Salihefendic, Russel Keith-Magee and Anton, a main conference organizer. Between going into the Sauna we had glasses of nice irish Whiskey or walked outside to the snowy freezing cold. Afterwards some of us went to the conference party and had good (despite being somewhat drunken) discussions with people from Yandex, the biggest russian search engine and several russian devs. All very friendly, competent and funny. The party lasted until 5:30am – with my fellow english-speaking talkers Armin Ronacher, David Cramer (a weekend in Russia) and me being among the very last. Going back to content, i felt particularly inspired by Jeff Lindsay’s talk on Autosustainable services . He described how he tries to provide several small web services, and how to organize cost sharing by its users. As services need resources, it’s a different issue than Open Cource collaboration which does not require such to exist. I heart several good sentences from my fellow talkers, for example one from Russel Keith-Magee describing a dillema of open source communities: “There are many people who can say ‘No’ but few who can say ‘Yes’ to something”. Amir Salihefendic desribed how the “Redis” database solved many problems for him, and some interesting concrete usages of “bitmaps” in his current endeavours like bitmapist.cohort. And of course Armin Ronacher and David Cramer also gave good talks related to their experience, Advanced Flask patterns and scalable web services respectively. With Armin i also had a good private discussion about the issue of code-signing and verification. We drafted what we think could work for Python packaging (more separately). With David, i discussed workflow commands for python packaging as he offered some good thoughts on the matter. Around the whole conference we were warmly cared for by Yulia’s company it-people.ru who overtook the physical organisation, and by Anton and his friends who organized the program. Maria Kalinina in particular had cared for the keynote speakers and many other aspects of the conference, and without her, i wouldn’t have made it. 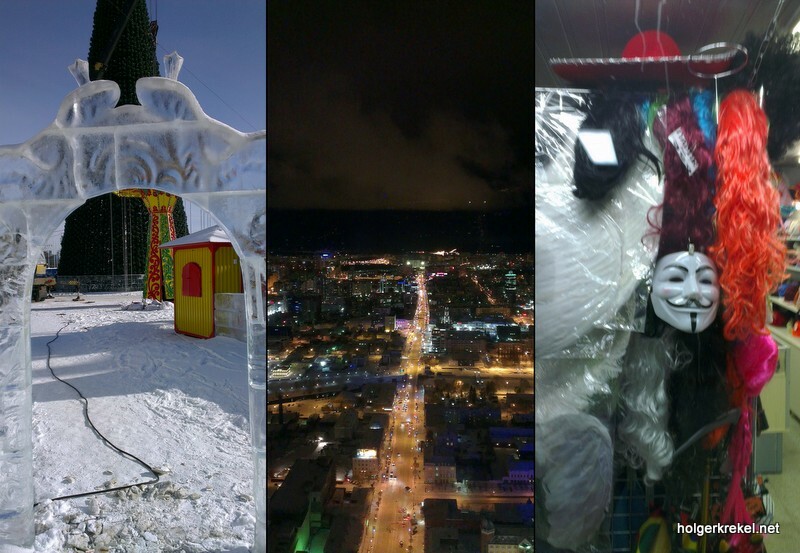 Anton drove us to the Asian European geographic border, and Yulia to the skyscraper of Ekaterinburg, overlooking the third largest city in Russia. 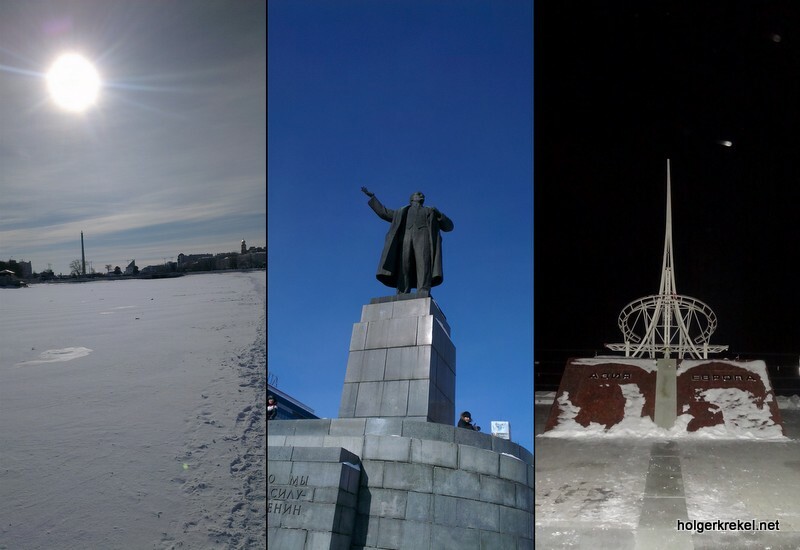 Russel and me also took the opportunity to walk around Ekaterinburg, looking at Lenin sculptures, buildings made of ice, frozen lakes, and the many shops and noises in the city. Lastly i went to the university with Russel to talk for two hours to students about “How Open Source can help your career” and we had a lively discussion with them and the lecturer who invited us. I offered my own background and stated that the very best people in the IT world are today collaborating through open-source. It’s a totally dominant model for excellence. (Which doesn’t mean there are not some good proprietary projects, they are just fewer i’d say). Two days ago i left Ekaterinburg and felt a bit sad because of the many contacts i made, which almost felt like the beginning of friendships.